Yes, classroom use of personal digital devices with access to technology tools can become a distraction, foster student disengagement, and enable academic dishonesty. Yes, analog tools – pencils, pens, masking tape, all manner of writing surfaces – did, still do, provide some means to the ends of distraction, disengagement and dishonesty – the 3Ds. And, what might guide us – beyond outright bans of laptops, tablets and smart phones, or an any technology is fine at any time because “they have to figure it out” mindset – in making wise use of digital technologies inside of the classroom? What might guide us especially as we early all of make some use of technology tools to support learning and teaching? Our most basic, often daily, use of tools like Moodle or Google suite as part of a course does cue students to expect that personal digital devices will be of use or minimally will not be banned for personal learning uses in a classroom. What happens when – as several undergraduate and graduate students have reported to me – those students who rely on electronic notes they’ve collected are told that computers, tablets and smart phones are not allowed to be turned on or used in any way during class sessions and they’re still expected to be active participants during the class session, as well as to find other ways to come prepared for class? When do you require students use technology in preparing for class, and will they then need to use personal devices to access what they’ve prepared during class ? When they prepare for class, do you require students use technology –to access course materials and complete assignments/homework? If so, might they then need to use personal devices to access what they’ve prepared during class? 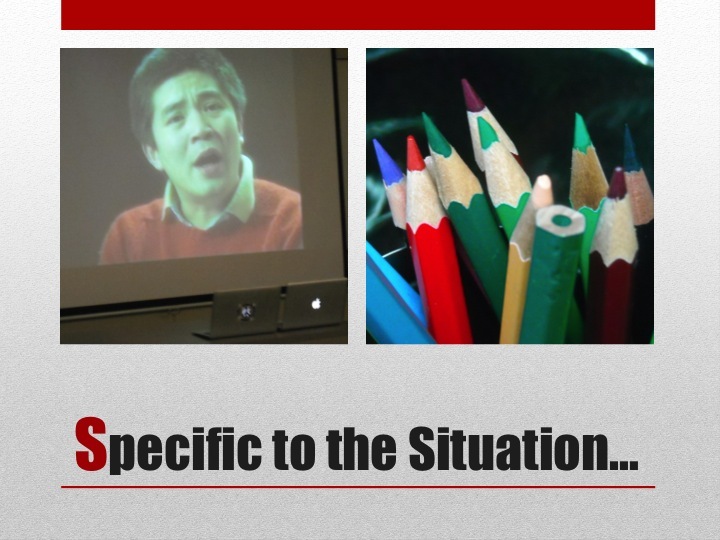 Specific situations shape delivery of your course materials in what ways? That is, how do your pedagogical choices along with expectations regarding student engagement and field-specific use of technology in “real world” settings impact how and when and why students will need to learn to specific technology tools and uses of technology in completing course work? 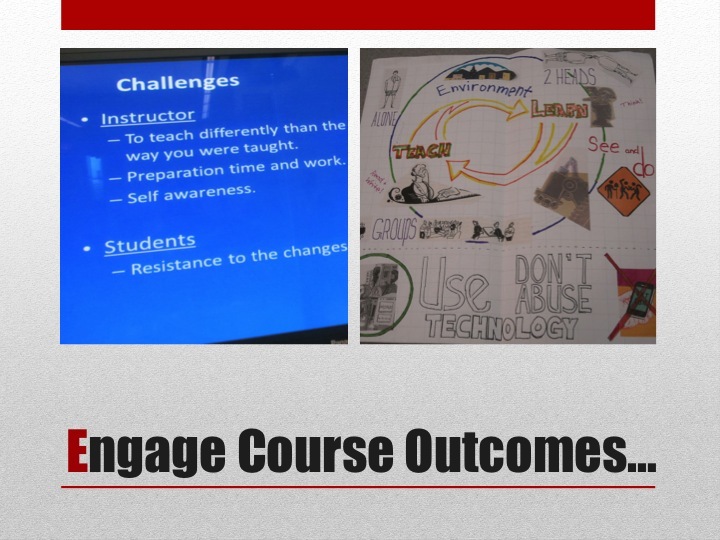 Engaging course outcomes – both learning (content) and developmental (communication) outcomes – requires what uses of technology for students to complete either daily or major assignments, from searching data bases to communicating with others to posting work for authentic audience feedback? How do I provide students with access to course materials – syllabus? readings? assignments? feedback? assessment? Why do I ask students complete “homework” – to practice learning? to problem solve? to prepare for team/group task? to begin learning ahead of a class session and then to build on it/extend that learning during class? 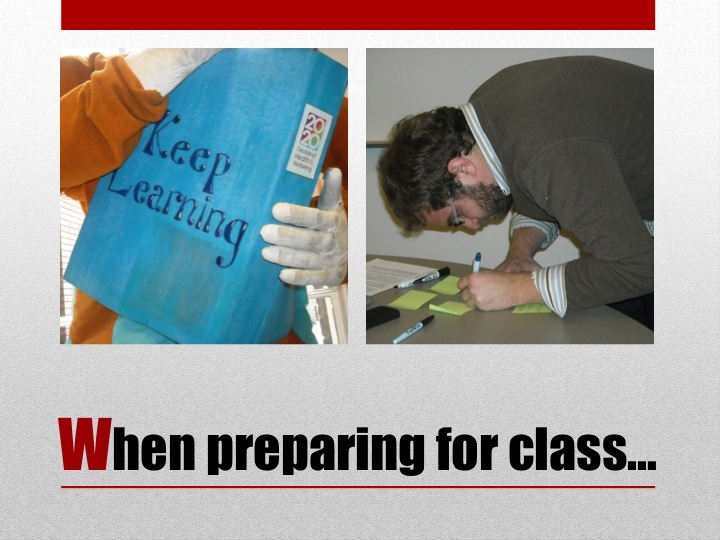 Will individual “preparing for class” work become the basis for in class activities? When I use analog tools – books, whiteboards, PostIts, index cards – as the spark for inclass learning, is there a technology tool that I could use to make the specific activity accessible to a broad range of students? embed accountability for students’ engagement in constructivist learning? gather information about student learning –before, during and after class sessions? If we deliver course materials and inclass presentations by means of technology, might we not need to develop policies and practices that help students engage – and learn best practices for making use of – resources via personal devices in the classroom? – consider whether the task calls for higher-level learning outcomes that can be best met collaboratively, or poses a problem best addressed by formal team over time or ad hoc small group completing a time-on-task activity to marshall resources and disrupt group think. Consider whether a particular class session might require students seeking and offering feedback among peers – commenting on electronic drafts of papers, suggesting particular research sources for a team project, offering alternative takes on a point of analysis in a group analysis of readings, pointing out gaps as well as asking questions about novel approaches in solving a problem. Using technology resources to share ideas – with peers and with the teacher synchronously – and to test for concept knowledge leverages technology tools provides avenues for timely seeking, providing and gathering of feedback. 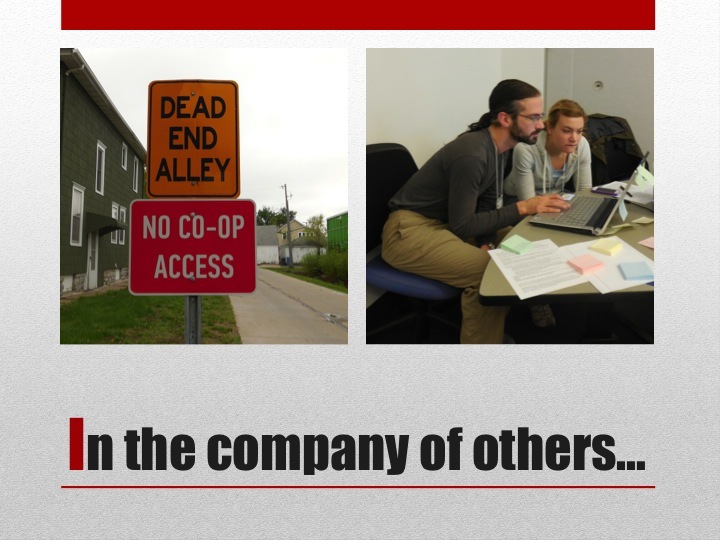 The photo at the left captures that moment when two of my students were telecommuting into class – one home with a sick child, another at a professional conference and wanting to participate for the full three hours of our class despite being 1/2 a continent away. Each student made use of Skype to connect to the class session, each via a separate computer that could be carried into small group conversations as well as placed strategically for whatever was going on with the large group. Each time I’ve made the offer of participation via Skype or Hangout available to a class, it’s only enhanced the classroom experience for all the students. No one picks up or spreads a flu bug. That student at a conference or other academic activity brings in material or observations gained in situ. For those moments when I might otherwise offer an “excused absence,” I can instead offer a “virtual attendance” option as suited to the specific learning situation. And I am happy to call out “Stow! those digital devices” in favor of using analog technologies – markers with whiteboards and colorful pencils with large size PostIts when I want students to engage in a generative session of “Drawing to Learn” as part of a jigsawed reading activity or to depict ideas that will become part of a gallery walk presentation session. I make use of PowerPoint as a tool to support my teaching when I want to engage students in testing, merging, expanding and remaking concepts. As part of advancing from what Bloom identifies as Lower Order Thinking Skills (remembering, understanding) to Higher Order Thinking Skills (Applying, Analysing, Evaluating, Creating) I create and share the slide deck ahead of class time, asking students to open the file so that they have the Notes View before them. The notes field will include key terms, definitions, resource links, and reminders of previous discussions/readings alongside talking points notes I will draw on that day for my extemporaneous and interactive presentation. Why the slides, the Notes View and the provision of key information? I want students to make use of the technology tools – my slides, their computers, our back channel conversation resources – to record what they are thinking, understanding, pondering, questioning, connecting – and not what I am saying. In this way, students are not transcribing information but evaluating ideas and concepts as part of thinking through a presentation; they are simultaneously attending to my “thinking aloud” and recording the development of their own thinking through of concepts; and they are making note of connections to pursue – often moving these notes into a more public space via back channels, by noting questions to ask, by recording a resource to share. In engaging the course outcomes, I also engage students in making meaning as part of the interactive presentation time and process. At this juncture, use of personal devices to access tools that support learning is a Go! in our classroom. And something about handwriting – not being able to write fast enough, not being able to read a teacher’s [cursive] handwriting on the board or in comments, or not being allowed to type notes which makes it difficult to synch inclass information with other course materials stored electronically. 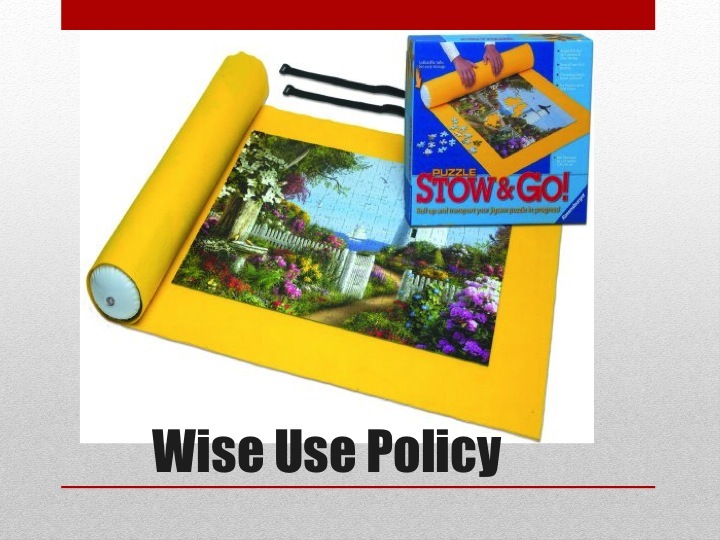 If I want you to “Stow!” – not be using – personal digital devices during a segment of the class, I’ll ask you to do so (and provide reasons). When using devices is a “Go!” I will let you know the when and why of that as well. Unless I begin class with a direction to Stow! the default mode will be that use of tech tools is a Go! until and unless I say otherwise. Please note, the Stow! direction might be planned into class session design, and I might also make use of this to take advantage of the particular learning moment, or to respond to classroom climate and/or address student conduct concerns. 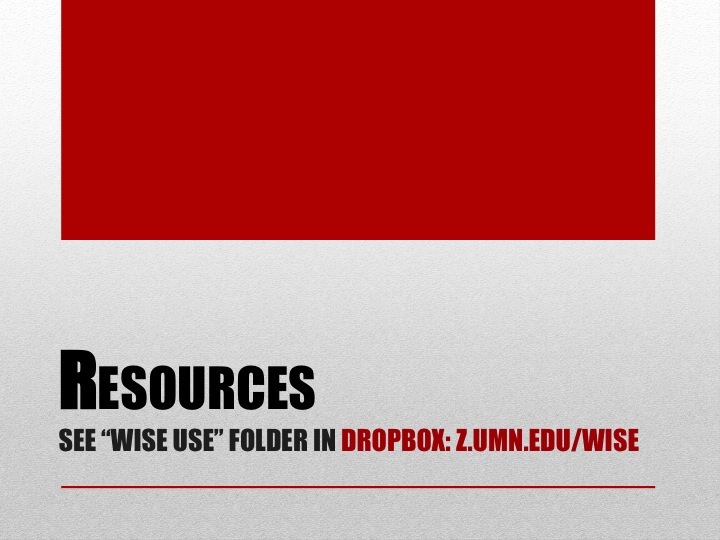 – are stored in a public access Dropbox folder: http://z.umn.edu/wise.